What is the situation with Kubon & Sagner? East View Information Services Inc. has finalized a legal agreement to acquire the assets of Kubon & Sagner Media GmbH, which ceased operation on June 30, 2017. Have Kubon & Sagner subscriptions been transferred to East View automatically? No. Former Kubon & Sagner subscribers are under no legal obligation to East View, just as East View is not legally obligated to supply unfulfilled 2017 orders. However, for those customers who decide to place 2018 orders with East View, we will do our best to deliver 2017 prepaid missing issues at our expense. Many of Kubon & Sagner’s suppliers have not received payment for your 2017 subscriptions. Why should I work with East View? 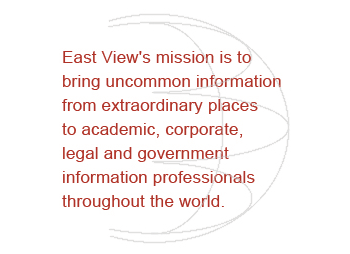 With nearly 30 years in business, and specialized in Eastern Europe and FSU resources for libraries, East View is a leading provider of databases, periodicals, books and microforms. The company serves many customers including academic institutions, government organizations, corporations, libraries and law firms. We offer competitive prices accompanied by unparalleled customer service. What products and countries does East View cover? East View covers a variety of products from subscriptions and standing orders to monographs, atlases and DVDs. We handle print, online and even microform formats. East View’s strength has always been in resources published in countries of the former USSR, Eastern Europe, East Asia and the Middle East. Do you support Sagner Digital, Kubon’s German e‐book package? No, Sagner Digital was sold to a different party; East View has no involvement in e‐books previously offered by Kubon & Sagner. However, we do offer e‐books in Russian, Arabic, Chinese and other languages. Does East View offer consolidation services? Yes. Your materials can be consolidated within the EU and shipped to your institution after customs clearance. East View has major offices in Minneapolis (USA), Moscow (Russia), and Kyiv (Ukraine) as well as support staff in Germany and China and partners throughout the world. For general customer service inquiries, please use periodicals@eastview.com, books@eastview.com, or online@eastview.com. Can we be invoiced in Euros? Yes. East View can invoice in Euros or US Dollars. Just let us know your preference. What about monographs and standing orders? East View offers hundreds of thousands of print titles and e‐books as firm orders, standing orders and on approval, as well as selection options using slips lists and email notifications. Can East View manage approval plans? Yes. East View already supplies many libraries with approval plans for monographs and DVDs from Eastern Europe, former USSR countries, Mongolia, Finland, Turkey, China, Japan and South Korea, covering a wide range of subjects, languages, and budgets. If you are interested in an approval plan for books from Eastern Europe or former Soviet Union countries, please let us know your areas of interest and we would be happy to walk through our approval plan profile template to show you all of the options for customization that are available. EDI invoicing and free vendor‐level MARC records accompany any approval plan. What about payment remittance within the EU? East View has a bank account in the EU and customers will have a choice to pay invoices to the EU or US bank accounts. Does East View have a Value‐Added Tax (VAT) identification number in Germany? East View’s VAT identification number is DE313548800. We show our VAT on all of our invoices. Do you provide customs clearance in Germany? Yes, we can provide customs clearance and consolidation in Germany for titles from non‐EU countries for a small service fee. You can choose between East View providing this service, or ask East View to have titles published outside the EU shipped directly to you.